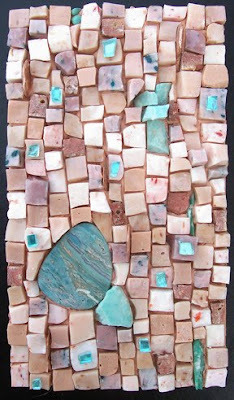 Margo Anton's Mosaic a Day: "Stacked"
I'm not super crazy about this one. For starters, I don't think there is enough tonal contrast for the mosaic to be truely effective. In addition, I would cut the background pieces smaller if I could do it all over again. However, I do like how I fixed the fact that this piece was a bit boring when I was finished--I glued small squares of reverse mosaic gold on top of other tesserae, which adds interesting depth when viewed in person.